Marriage is serious business. But it’s funny, too. 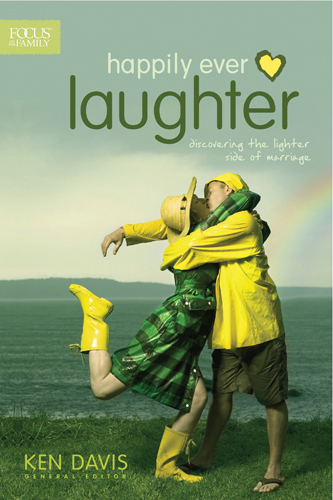 Ken Davis, editor of Happily Ever Laughter: Discovering the Lighter Side of Marriage, presents 30 very short, funny stories about marriage. Besides being a riot to read (mostly), they present a valuable message: yes, it is possible to find humour in situations charged with emotions…and doing so is certainly good for our marriages. This slim book is perfect to fill an empty waiting moment. In fact, I read it while waiting for my husband at the airport. This was the first time in years that he hadn’t used the park and ride, and he called three times to make sure we wouldn’t forget about him. Poor guy! I dragged myself from the garden, dressed up, drove all the way to the airport, and settled myself, with the book, right where I’d see him immediately. Imagine, if after all that effort, I’d be reading while he walked down the stairs! I held the book up high, so I could watch the stairs over the top of it. There was no way I was going to miss a proper airport reunion. And then, suddenly, there he was…behind me! Rather abashed, I realized that this was one of those moments celebrated in Happily Ever Laughter, the kind that could be a disaster or a joke, depending on how I responded. So we laughed… and we did have a happy airport reunion. I suppose that is what the book can do for everyone: remind us to lighten up and see the fun in our relationships. Some of the stories made me wince and my husband chuckle; other really funny ones caused my husband to be solemn. Hmm! Unfortunately, a few stories seemed to be just on the verge of showing irreverence, although I don’t think the authors meant that. When my children found Happily Ever Laughter on my desk, they carried it off, chuckling. Since it’s a Focus on the Family book, I could be sure that it had no inappropriate content, and was happy to let them enjoy the lighter side of marriage as well. Each chapter ends with a wise Laugh Lesson to ponder. Although this book will not restore a troubled marriage, following its example of laughing at the crazy times could prevent small troubles from growing into large ones. We celebrated our anniversary last week, and we hope to live Happily Ever Laughter. To see if this book is for you, check out the first few chapters. Disclosure: Tyndale House provided me with a copy of this book in exchange for my honest opinions. Sounds like a good one! Sorry I missed the chance to review it. 🙂 Hope you are doing well. Sounds like a good book. I’ll have to see if the library has one so I can read it for the summer reading program. Stacy, it’s barely out, so the library will not have it yet, but you may be able to get them to order it. It’s a good thing for a library to have.